Today's Letter of Note adds an interesting angle to one of the most famous sagas in modern cinema. 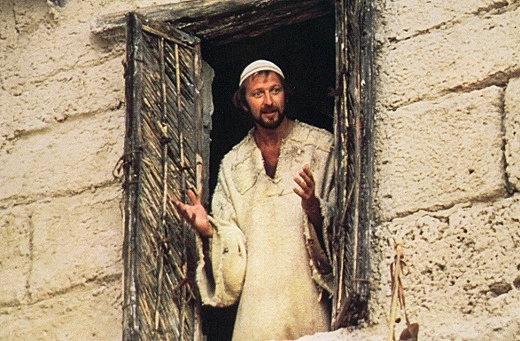 When Monty Python's Life of Brian was released in 1979, it caused an enormous amount of controversy because of its irreverant depiction of religion. It was accused of being blasphemous, being banned in several countries and by certain councils in England. There were angry protests by church groups, especially in America - and as usual in these cases, most of the people protesting against the film hadn't actually seen it. The Pythons responded to the controversy surrounding Brian in numerous ways. Most memorably, John Cleese and Michael Palin had a TV debate with Catholic academic Malcolm Muggeridge and the Bishop of Suffolk, during which debate the Bishop remarked (ridiculously) that the pair would "get their thirty pieces of silver". What is less well-known is the letters that the Pythons send out to reassure individual punters that their film had been severely misrepresented. You can find an example of said letter here. As a Christian, I find the Life of Brian fiasco fascinating. People who had never seen the film nonetheless managed to embody the film's theme of religious hysteria. Though none of the Pythons are Christians to the best of my knowledge, they acknowledged in the Live at Aspen documentary that they were not out to make fun of Jesus, on the grounds that they agreed with his teachings. It's a film about blasphemy rather than a blasphemous film, and the hysteria it created only goes to prove its point. Plus, it's really hilarious. Finally, for anyone still convinced that Life of Brian is actually blasphemous, I leave you with the words of Eddie Izzard: "Jesus is a very different spelling to Brian".